The National Forest Service notes that the American version of the holly tree has similar leaves and berries to that of the English holly species, a fact not lost on the homesick pilgrims when they first arrived in 1620. American holly has evergreen leaves, with the foliage being a staple of Christmas decorations. Identifying the holly leaves is not particularly taxing, although many have never actually seen them on the tree from which the many landscaping cultivars of holly stem. The leaves of the holly tree are from 2 to 4 inches in length and vary in width, with some as narrow as ¾ inch and others being as wide as 1-1/2 inches. 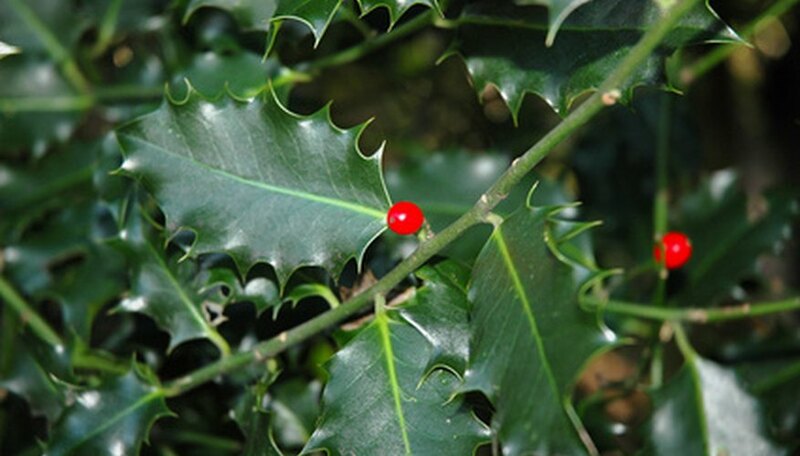 Holly leaves are elliptical in shape but possess widely spaced, prickly spines along the edges. This placement of spines enhances the wavy and distinct scalloped look of the holly leaf. The holly leaf is thick, stiff and has a texture similar to leather. The foliage on the holly tree or shrub hybrid grows in an alternate pattern on the holly branches. The upper surface of a holly leaf is a dull shade of green. The color may be a darker hue of green or it can be a greenish-yellow variation. Either way, the underside of the holly leaf typically is lighter than the opposite side. Many of the hybrid cultivars of holly feature a dark, glossy green color. Holly leaves remain on the tree year-round, with leaves staying on for as long as three years before finally falling off as new ones grow in to take their place. Several diseases can cause holly leaves to take on a different appearance. One is powdery mildew, which can bring about a white-looking coating on the leaf’s surface. Another is leaf spot, round blemishes that come in 14 diverse types that can harm the tree. Leaves suffering from this fungi will have small lesions on them. Before laws existed that protected the holly tree in many states, the branches and berries were often pulled off to be used as Christmas decorations. This practice often would cause serious damage to the host holly tree, with the tree taking on a ragged look--some even perishing.